***THIS EVENT HAS BEEN CANCELLED*** ANYONE THAT HAS PURCHASED TICKETS SHOULD CONTACT THE TICKET COMPANY FOR A REFUND. 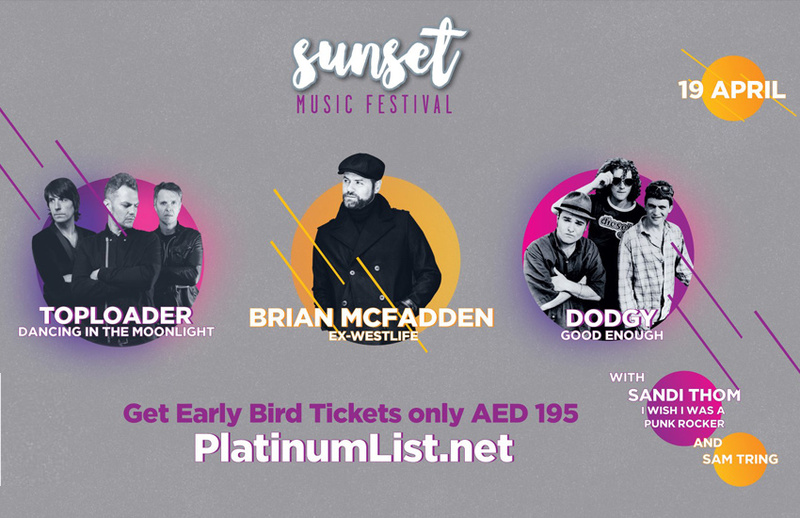 The capital’s signature day-to-night music festival is set to offer even more nostalgia and casual vibes as Brian McFadden, lead singer of boy-band sensation Westlife, is announced as the headliner for this year’s Sunset Music Festival. Last year’s event saw 90’s RnB royalty Dru Hill and Blackstreet perform. The 90’s theme continues for a third year as the event turns to a greater ‘Pop’ theme this year, with the former Westlife singer Brian McFadden, and UK alternative rockers Toploader and pop rock trio Dodgy. Sunset Music Festival will have five acts lined-up under one extraordinary ticket to transport music-lovers back to the 90’s for an evening filled with singing, dancing, fun and socialising.